VW CEO Herbert Diess in Washington on Tuesday: "We need additional capacity here in the United States, we need an additional car plant for VW and Audi combined." WASHINGTON -- Volkswagen's CEO said on Tuesday after a meeting at the White House that the German automaker was building an alliance with Ford Motor Co. and that they might use the U.S. automaker's plants to build cars. Ford and VW said on June 19 they would explore a strategic alliance and they agreed to a memorandum of understanding at the time. Talks further intensified this fall, the automakers said in October. The automakers have said previously they are talking about potential collaborations across a number of areas. VW has an assembly plant in Chattanooga, Tenn. Of the need for a new plant, Diess said the company is in "quite advanced negotiations in Tennessee but there might be other options as well." Ford and VW have been in talks for more than a year about the German automaker investing in Argo AI, the American automaker’s self-driving technology partner, to jointly develop autonomous cars, according to people familiar with the discussions. The two automakers also are considering tie-ups to produce electric vehicles and share manufacturing in regions around the world, the people have said. 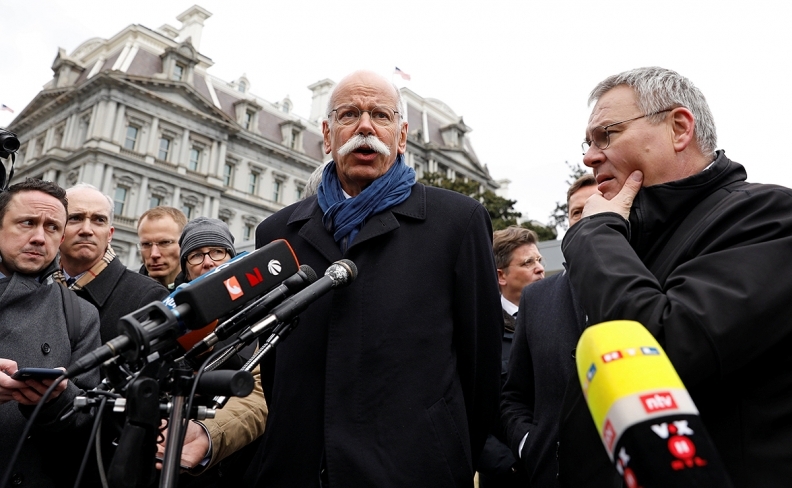 Daimler CEO Dieter Zetsche: “We weren't here as a trade delegation." Any agreement for VW to use Ford plants for production would presumably require negotiations with the UAW, which has been trying unsuccessfully to organize VW's plant in Chattanooga. UAW Ford Vice President Rory Gamble, through a spokesman, told Automotive News he would reserve comment on this issue "until he has formal discussions with Ford." The carmakers have found themselves in harm’s way as Trump wields higher tariffs as a cudgel to rebalance trade with both China and the European Union. BMW and Daimler are the biggest car exporters from the U.S. to China, while VW’s two most profitable brands, Porsche and Audi, would get hammered if Trump follows through with a potential 25 percent levy on imports from the EU. The White House is looking to whittle down a $30 billion automotive trade deficit with Germany with increased production in the U.S., Commerce Secretary Wilbur Ross said ahead of a meeting with automakers in Washington Tuesday. It remains the biggest single chunk of an overall $65 billion trade deficit with the EU. Daimler, the maker of Mercedes-Benz luxury cars produces vehicles in Tuscaloosa, Ala., shipping many of its SUVs made there to China. Daimler employs some 3,700 workers at the U.S. site, which can churn out more than 280,000 vehicles per year, including GLE and GLS SUVs for global markets and C-class sedans for North America.